Arsenal host Chelsea at the Emirates Stadium on Saturday in a Premier League clash. The game could be a defining moment in the Gunners’ season, as defeat would see them fall four points behind the Blues – and fourth place – making the prospect of qualifying for next season’s Champions League via a top four finish a distinct impossibility. Neither side are heading into this weekend’s meeting in particularly impressive form. Arsenal fell to a 1-0 defeat to West Ham United last time out, whilst Chelsea have failed to beat Leicester City and Southampton in recent weeks. Both sides will want to lay down a marker this weekend. Will Maurizio Sarri’s side assert their dominance with a convincing win over their local rivals? Or will Unai Emery’s men be able to silence their critics and blow the top four race wide open with a win? There have been many memorable clashes between these two London giants in the Premier League down the years. Hopefully, this Saturday will serve up another spectacle to savour. 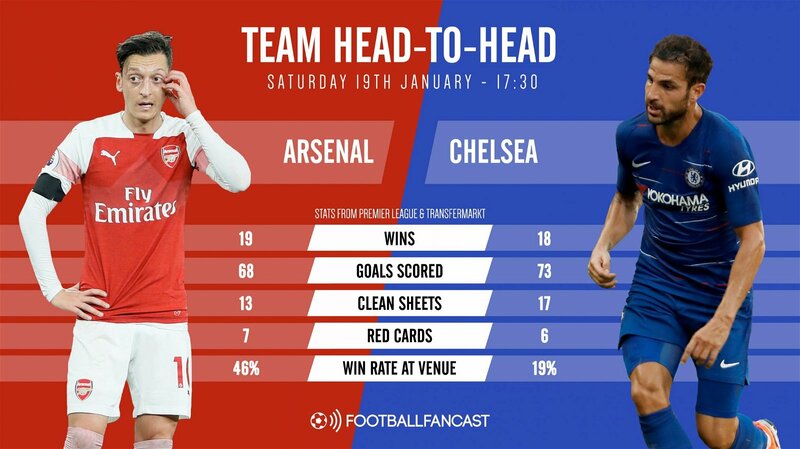 In previous seasons, Arsenal and Chelsea have proved hard to separate, though the Gunners have one more victory over Chelsea under their belts than the Blues can claim over them. However, the vast majority of these Arsenal wins came in the first half of the Premier League era. The Gunners have, in fact, won just one of their last 14 league meetings with the Blues. On top of that, Chelsea have scored more goals and kept a greater number of clean sheets in this fixture than their opponents. Were this weekend’s meeting set to take place at Stamford Bridge, Chelsea would be the clear favourites. However, the history of this fixture at the Emirates Stadium throws up the greatest imbalance in these clubs’ head-to-head record. Arsenal have won 46% of their meetings with Chelsea on home turf, which ought to give them faith heading into this next instalment. Both sides will be relying on their attacking talismans to serve up a moment of inspiration that proves the difference this Saturday. Since arriving in north London in January 2018, joining from German side Borussia Dortmund, Aubameyang has shone in the Premier League. The pacy Gabonese hitman has already registered 14 goals this season, despite having to often take up a role on the left flank. Chelsea’s Belgian superstar Hazard has only been slightly less prolific, with 10 league goals racked up this season. However, he’s a far more creative force than the Arsenal No. 14. Sarri will be relying upon Hazard to both start moves as well as finish them, and his average of 3 key passes per game and total of 10 assists so far suggests that he is up to that task. Neither have been at their best in recent weeks, but both thrive on the big stage. 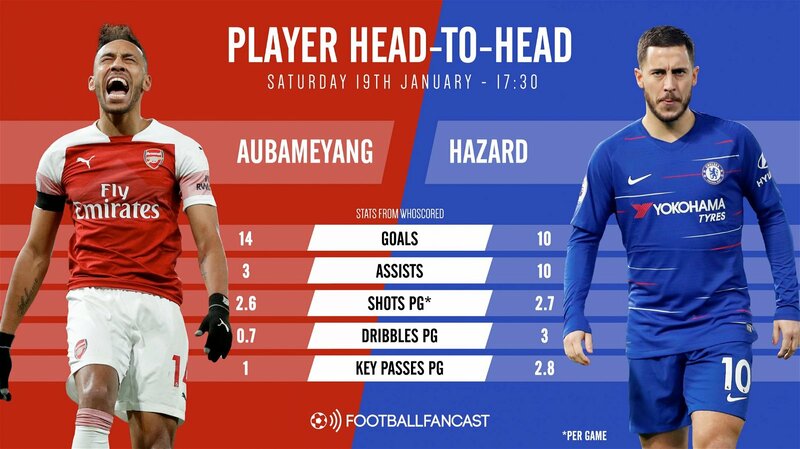 The difference between Arsenal and Chelsea this weekend will likely come down to which star man can rise to the occasion. 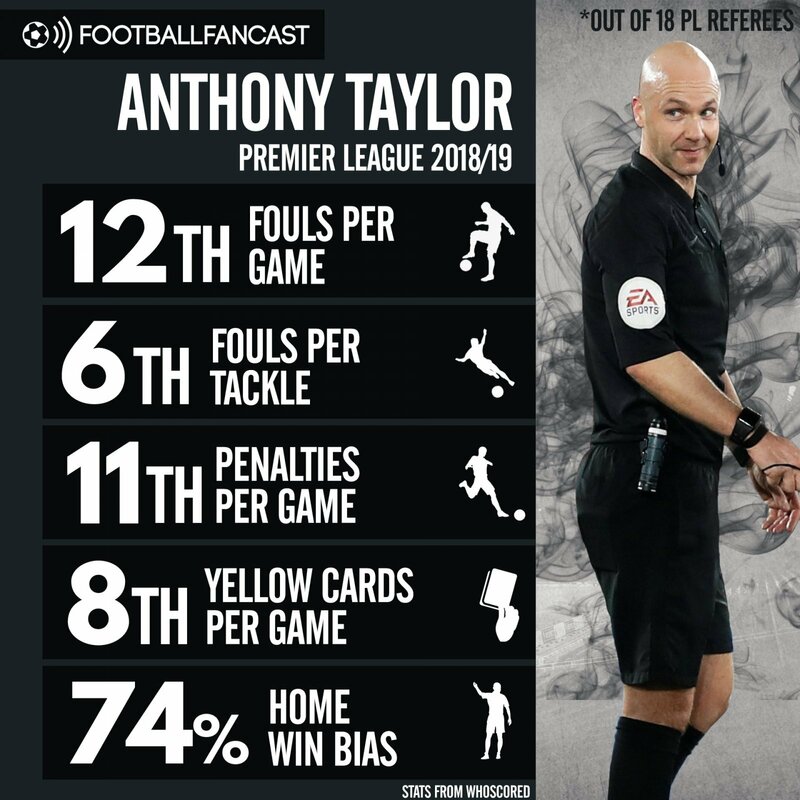 Anthony Taylor is perhaps one of the least controversial and contentious Premier League referees, and the statistics back up the calm consistency in his game. Of the 18 officials to have overseen a top flight match so far this season, Taylor ranks 12th in terms of fouls per game, 6th in terms of fouls per tackle and 8th in terms of yellow cards per game. However, his home win bias of 74% is the 3rd highest out of the 18 referees, and the two above him – Andy Madley and Graham Scott – have overseen only 9 Premier League games between them this season, compared to Taylor’s 19. Chelsea will be looking to upset that trend this weekend. Arsenal have seen a number of important first team figures, including Nacho Monreal and Hector Bellerin, return from injury in time for this fixture, although we’re only expecting the latter to return to the starting XI. However, the continued absence of Henrikh Mkhitaryan will be a frustration, especially as the Gunners have struggled to create chances in recent weeks, and the Armenian has the ability to carve out goalscoring opportunities for his teammates. There has been plenty of talk about Mesut Ozil’s role in this Arsenal team, but we’re expecting Aaron Ramsey to be called upon ahead of the World Cup winner after he toothless display against West Ham last weekend. Chelsea’s injury woes aren’t extensive, though they could be without Alvaro Morata for the trip to the Emirates. The Spaniard won’t be a huge miss, given his poor form this season, but Sarri must still find a solution to his side’s lack of an out and out striker capable of scoring the amount of goals they need. Hazard could potentially line up as a centre-forward, but that is not the most efficient use of the 28-year-old’s prodigious talent. Otherwise, former Arsenal man Olivier Giroud could lead the line for the Blues. If the Frenchman were to get on the scoresheet, he would become only the second man to score for both clubs in Premier League meetings between the two, after Cesc Fabregas. Sarri would be wise to give Giroud the nod, as the 32-year-old’s hold up play and ability to link between his fellow attackers gives the Chelsea frontline a different dimension and can bring the best out of the likes of Hazard and Willian.